To uncover the secrets behind how great records were produced and gain more control over her career as a Singer/Songwriter, Natali boldly stepped in to the ver male-dominated world of Audio Engineering and production. These are some samples and stories of Natali’s work. Natali completed a Diploma in Audio Engineering at the SAE Institute London as the only woman in her year, achieving top marks for her assignments. During her time there Natali made every possible use of the amazing facilities to work on her own music and record and assist on as many recording sessions as possible. She worked with acts such as Ursa Minor (Little Bear) and recorded anything from gongs, drums and synths to foley for film. Having access to some of the best gear in the industry meant that she became confident using the SSLG+, Neve VR, some incredible outboard gear and microphones and Pro Tools and Logic as DAW’s. After SAE Natali completed a 3 month internship at Urban Chain Recording Studio where she was asked to stay on as an Engineer until she had to leave for the commencement Songwriting degree. Urban Chain Studios was kitted out with some fantastic vintage equipment. Natali had her own set of keys and used the studio a lot when it was closed to rehearse and record her own band and try out some of the gear. In the eight months that she was there she recorded many sessions including acts like Mee & the Band and Amy Darling. 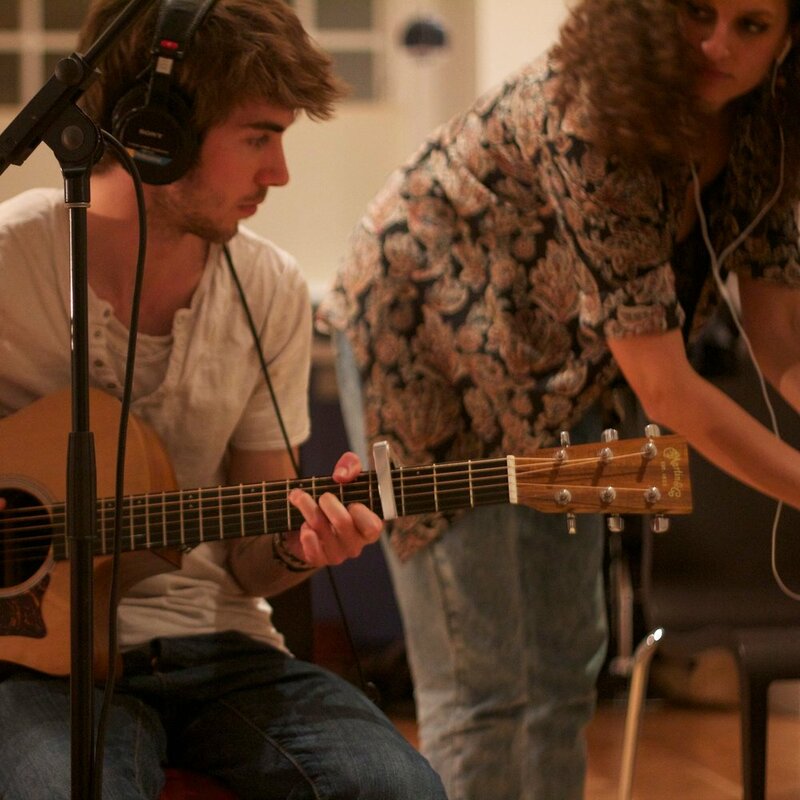 Today Natali’s home studio has moved to a spacious premises in Walthamstow where she has some industry standard mics and equipment as well as guitars, ukuleles and amps. This space is perfect for recording voice overs and vocal tracks. To record in the comfort of Natali’s home studio or learn about recording techniques get in touch via the contact form. Raphael Luther, AKA Lyosun who played acoustic guitar in China Doll on the Feral City EP recording guitar at a house with beautiful acoustics in Southwest London. Having a mobile studio means that you can do some wonderful recording sessions wherever you are! If you would like Natali to come and record you on location, be it in a yurt, a gig or your home please be in touch via the contact form. Natali recorded, mixed, produced and mastered this record from the comforts of her first home studio. Natali had a lot of creative freedom working with Nega Jaci which made it a really enjoyable experience for her. “Everything I had learnt after studying a year of Audio Engineering went out the window when it came to recording these beautiful gongs.” Natali used 9 microphones for this recording and set them up in any space that she could find that could capture the instruments well without interfering with the therapy session. Satu is an amazing sound healer and Natali regularly attends her Gong Baths. Even though there is so little online about how to record these instruments, Natali felt she learnt a lot from the process and is currently working with Satu feeling confident they are beginning to capture their true essence. Visit soundintent.org to book your gong bath with Satu.